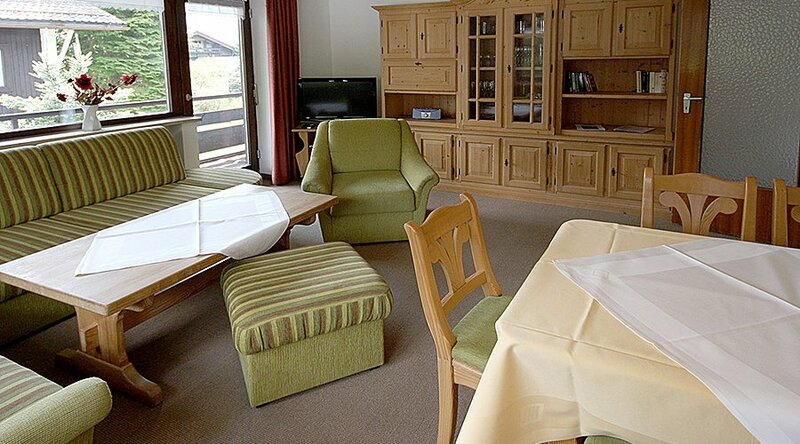 Our spacious and comfortably furnished 1- to 3-room apartments are distributed throughout Oberstdorf. 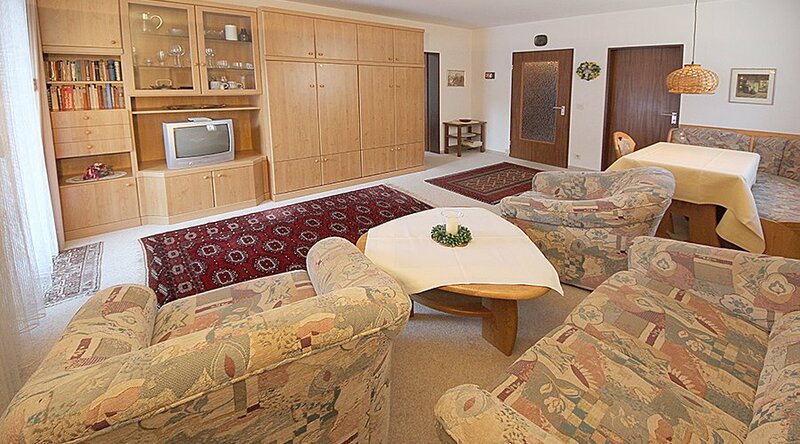 Enjoy our apartments in the center of Oberstdorf, near spa garden, next to the cross country ski-run or at the meadows. 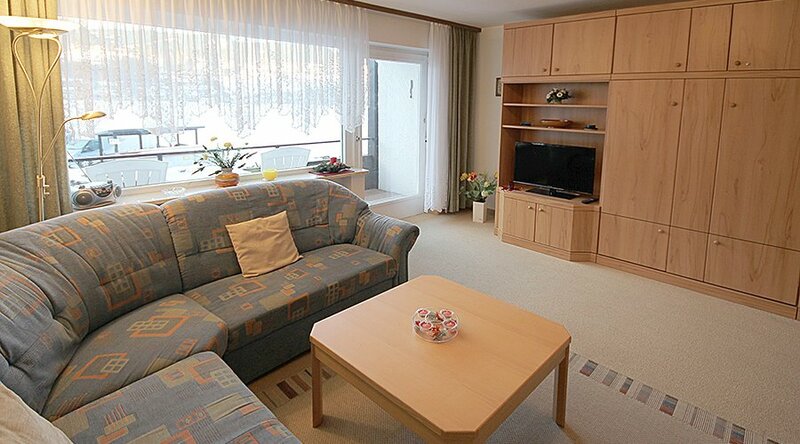 In and around Oberstdorf our very beautiful and well equipped apartments are located. Experience the largest ski area in Germany with Nebelhorn, Fellhorn, Kanzelwand, Walmendingerhorn and Söllereck and explore Oberstdorf and its valleys through the huge hiking area. For sports enthusiasts, many of our apartments are located in close proximity to the ice rink, the ski jumps, the cross-country ski trails or the ski slopes. 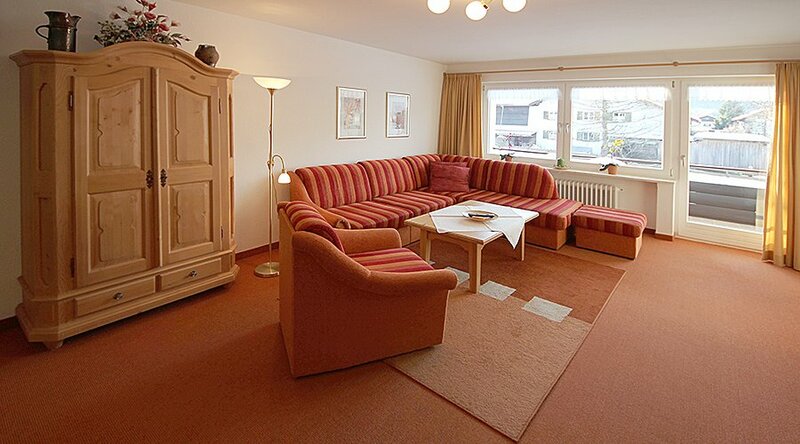 Location: This spacious 3-bedroom apartment is located in a typical residential house in Oberstdorf. Surrounded by a garden and a nearby park, you will enjoy a recovery holiday. The surrounding meadows invite you both for hiking and cross-country skiing. The village center is just a 7 minute walk. Your apartment: This nice furnished 3-room-apartment consists of a livingroom with sofa-sleeper, dinette, tv and radio, 1. sleepingroom with doublebed, 2. sleepingroom with 2 single beds, kitchen with dish washer, coffeemachine as well as a bathroom with shower and toilet. Washingmachine and dryer in the house. Location: Not far from the cafe Gerlach, our spacious 3-bedroom apartment is in a 2-story house. It is quiet and close to the center. The marketplace, along many shops and restaurants, you walk in 5 minutes. Also close by are railway station and bus station. From here you can easily reach the ski or hiking areas. 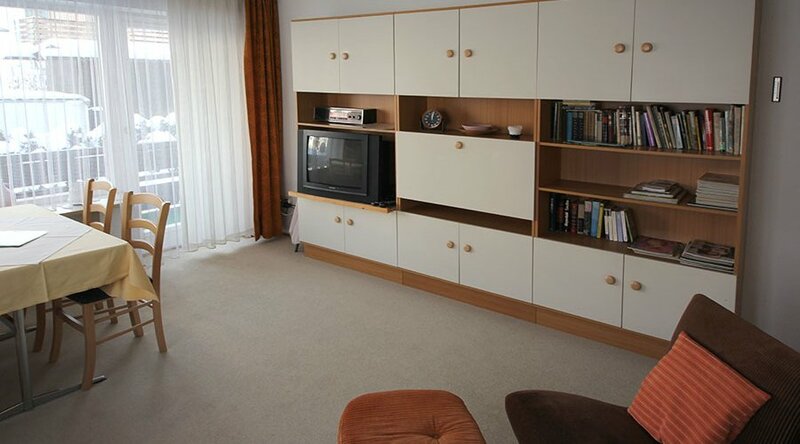 Your apartment: This nice 3-room apartment has a living room with sofas, dining table, TV (SAT). The master bedroom has a double bed, large wardrobe and a third sleeping possibility. The living room and the bedroom have access to the south-west balcony with a beautiful view. The second bedroom has a double bed with wardrobe and offers space for two more people. The kitchen is fully equipped with coffee maker, toaster, kettle and dishwasher. The apartment has a newly renovated bathroom with shower and bath and a separate toilet. Use of washing machine and ski-room Bicycle storage is possible. Location: In a typical regional house, our beautiful 3-bedroom apartment is situated with terrace and a small garden. Only 3 minutes away is the famous Oberstdorfer Holzofenbäckerei. The tennis courts are just 150 meters away. 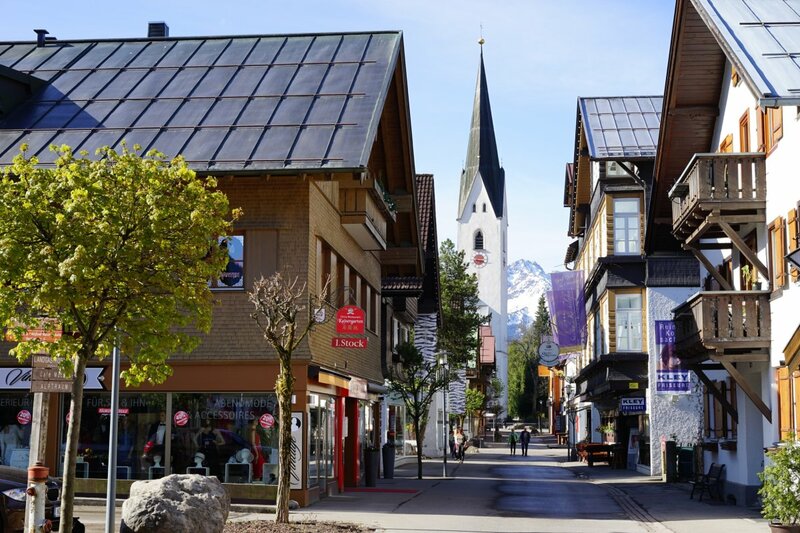 The Oberstdorf's market place with shops and restaurants around is explored in 5 minutes. Your apartment: This nice and cosy furnished 3-room-apartment consists of a livingroom with sofa-sleeper, dinette-oriel, chimney-bench, radio and tv, sleepingroom with doublebed and cupboard, sleepingroom with sofa-sleeper, kitchen with stove, coffeemachine and toaster as well as a bathroom with bathtub and provision for shower, toilet. Washingmachine and dryer in the cellar. 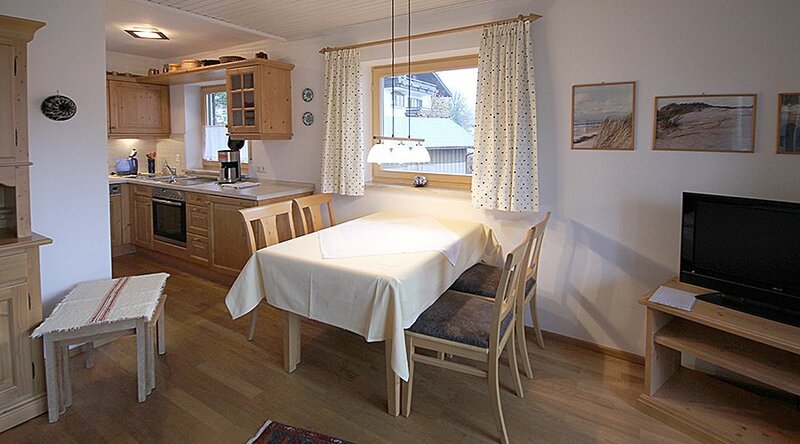 Location: The completely renovated 2-room apartment is located in a two-storey house in Oberstdorf. Bus stop and cross-country skiing are nearby. 50 meters away is the nearest grocery store. The town center, you can take the local bus or easily reach in about 15 minutes by walking. Location: The beautiful 2-room apartment is located in a 2-storey house in a quiet location overlooking the meadows and the adjacent river Stillach. The cross-country trails are right outside the house. Diagonally across your home is a bus stop. From here you can go in any direction, whether ski areas, center, ice rink or Erdinger Arena. Your apartment: This nice furnished apartment consists of a livingroom with sofa, 2 foldaway beds, dinette and tv, sleepingroom with double beds, kitchen with coffeemachine as well as a bathroom with bathtub and provision for shower and toilet. 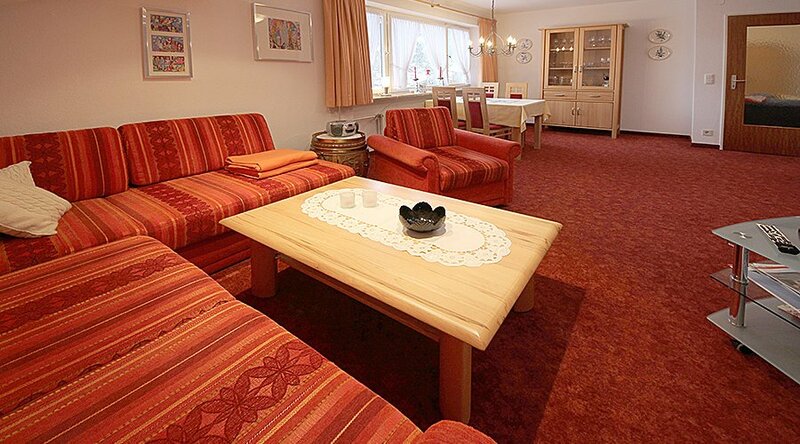 Location: In a beautiful residential area of Oberstdorf, you can find our 2-bedroom apartment. The apartment is located in a residential building, features terrace with garden. You will find peace and yet just a few minutes from the railway station, the town center with shops, restaurants and cafes. The traditional Holzofenbäckerei is located nearby. Your apartment: This nice 2-room-apartment consists of a livingroom with 1 foldaway bed, dinette and tv, sleepingroom with 2 beds, kitchen with coffeemachine and dishwasher, bathroom with bathtub and toilet. Location: Quiet zone, about 300 meters from the Nebelhorn cable car station, the ice rink and the Erdinger Arena, our 2-bedroom apartment is in a 2-storey residential building. The town center (marketplace) is in about 10 minutes walking distance. Numerous restaurants are located nearby. Your apartment: This cosy 2-room-apartment consists of a living-room with sofa-sleeper, dinette, tv, sleepingroom with 2 single beds, kitchen with oven, dishwasher, toaster and coffeemachine as well as a bathroom with shower and toilet. Location: In a larger apartment house are our 1-bedroom or 2-bedroom Appartements. 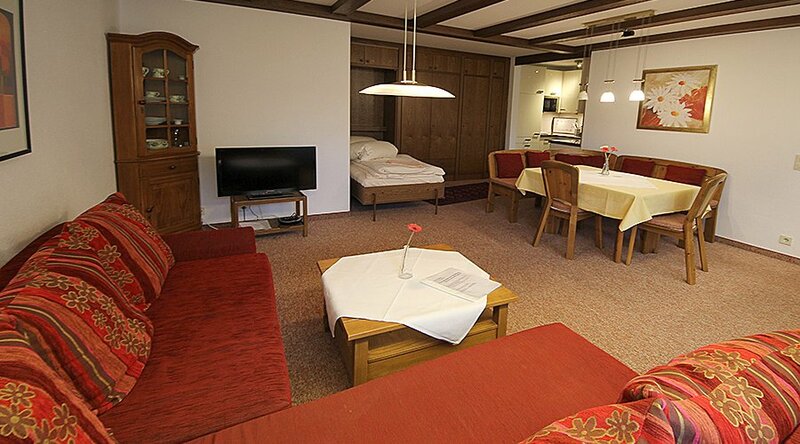 The house itself is located close to the spa gardens and the Vitaltherme the resort Oberstdorf. The quiet location of the house offers a relaxing getaway. In a few minutes you are in the center, surrounded by shopping streets, cafes and good restaurants. Your apartment: The nicely furnished 2-room apartment in the immediate vicinity of the spa park has a living room with a single Murphy bed, sofa, dining area, color TV, bedroom with double bed and radio, kitchenette, optically separated, fully equipped with dishwasher, oven, microwave, bathroom with tub and toilet. Washing machine and dryer in the cellar, ski room. 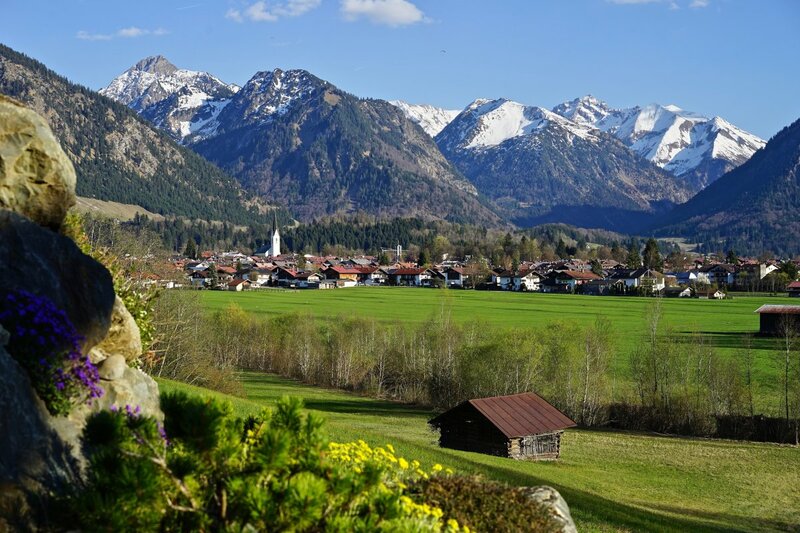 Location: Not far from the campsite Oberstdorf our 2-room apartment is located in a residential house in Oberstdorf. The town center, Erdinger Arena, ice rink can you can reach in about 15-20 minutes by walking, or use the direct local bus. With your Allgäu Walser Card you can use all buses in the village Oberstdorf free. Your Apartment: This nice 2-bedroom apartment has living room with 1 double sofa bed, dining area, color TV, radio, bedroom with 2 upholstered chairs and seating area, kitchen with coffee machine and oven, bathroom with tub and toilet. 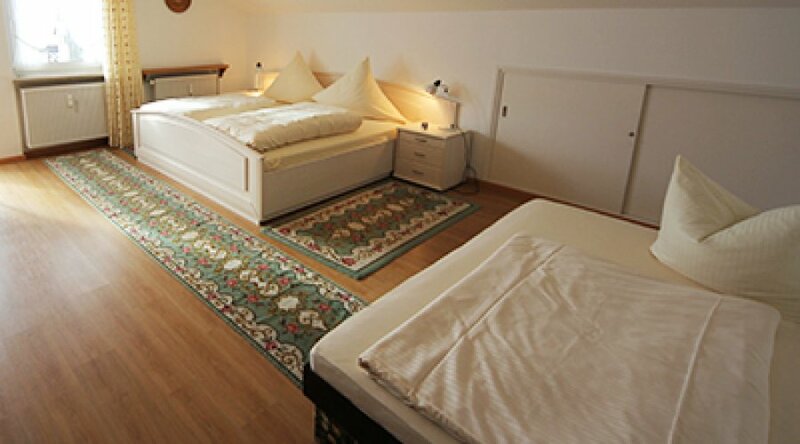 Location: In a larger apartment house are our 1-bedroom or 2-bedroom Appartements.Das house itself is located close to the spa gardens and the Vitaltherme the resort Oberstdorf. The quiet location of the house offers a relaxing getaway. In a few minutes you are in the center, surrounded by shopping streets, cafes and good restaurants. Your apartment: The completely newly furnished 1-room apartment has a spacious living room with 2 folding beds, sofa with sleeping function for up to two more guests, dining table, flat screen TV and radio / CD. The separate kitchen also completely new, is equipped with 4 Cerankochstellen / hood, microwave, dishwasher, refrigerator, coffee maker, kettle, toaster and egg cooker. Bathroom with bath and shower, toilet, hairdryer. Telephone with internet connection (LAN / WLAN). Washing machine and dryer are in the basement, as well as a space for skis. 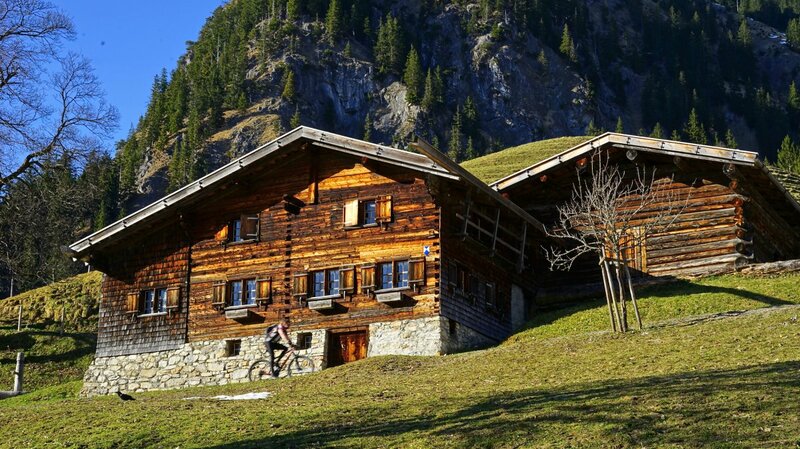 Location: Right on the Nebelhorn station is situated the Nebelhorn Appartement Haus. Among many other small apartments our newly-renovated apartment is located here. The ice rink, the Erdinger Arena are within walking distance. Nearby many shops and restaurants you can find on your 10 minute walk to the market place. Your apartment: This modern and well equipped 1-room-apartment consists of a livingroom with 2 foldaway beds, sofa, dinette and kitchenette as well as a bathroom with shower and toilet.